JungleDocs Rules are the easiest way to manage JungleDocs features. They are highly customizable and easy to work with. To create new rules for a specific list or library you have to run JungleDocs from the ribbon and create the rules from the JungleDocs interface. These newly created rules will be saved to the particular list or library you have selected and will therefore not be available in other lists/libraries. After you install and activate JungleDocs, you will already see default Base rules for the existing content types in your list/library. When you add a new content type to a library, JungleDocs will automatically create a new base rule for that library. Base rules are used to create new documents, items, folders or document sets in the current list/library. The rule has a content type assigned to it, so it is stored in a specific list/library. The content type, in turn, has a template assigned to it. This means Base rules have templates assigned to them. This rule is a foundation for all other rules used by JungleDocs. To add a Base rule, open JungleDocs, click the New tab, then click New base rule. In the next window enter all of the required settings (Rule name, Small Parts library, file naming scheme etc.) and click OK. You will notice that you can edit the template here. 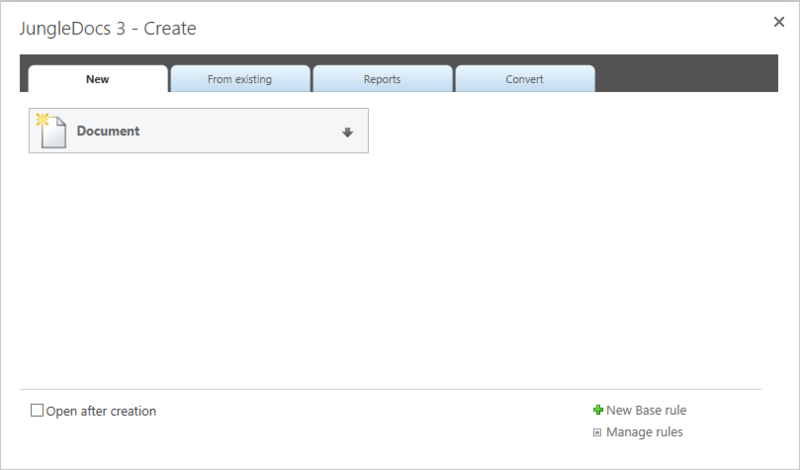 With the Base rule active and set you can now configure New from existing and Reports rules. New From Existing rules are used to consume existing metadata of other items (items or documents) to speed up the document generation process and save time on typing information manually. This way you can create a new item and pass the selected item's metadata to the one you wish to create. To create a From Existing rule, navigate to the list or library that you are going to use to create documents (source list/library), run JungleDocs from the ribbon, select the From Existing tab and click New From Existing rule (bottom right corner). In the new window select the target library that contains your content types and base rules by clicking Browse. Select a base rule with the required content type and template. 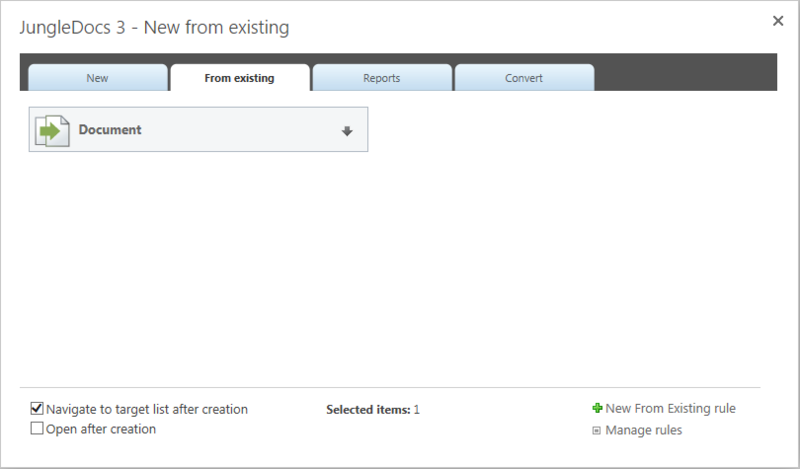 Modify other settings, such as column mapping, and click OK.
Report rules are used to export multiple items from a list. It is the same with the reports rule. 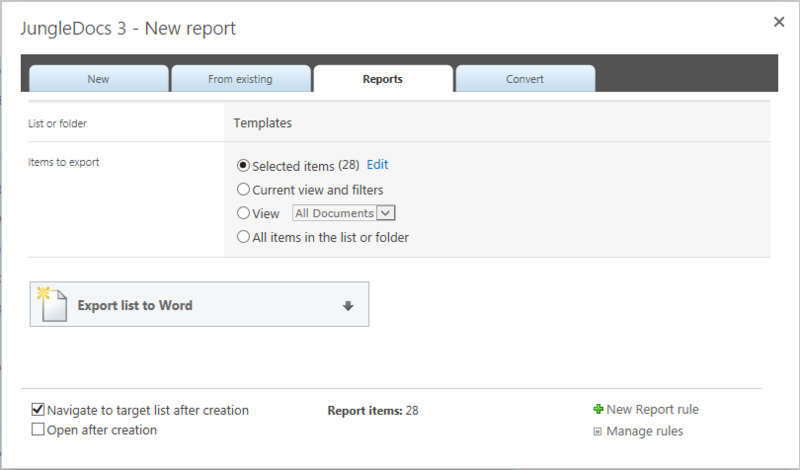 Select the Reports tab and click New Report rule. Select the target library, the Base rule, set the rule name and column mapping and click OK.
Now we can move on to template configuration.